Hi everyone! 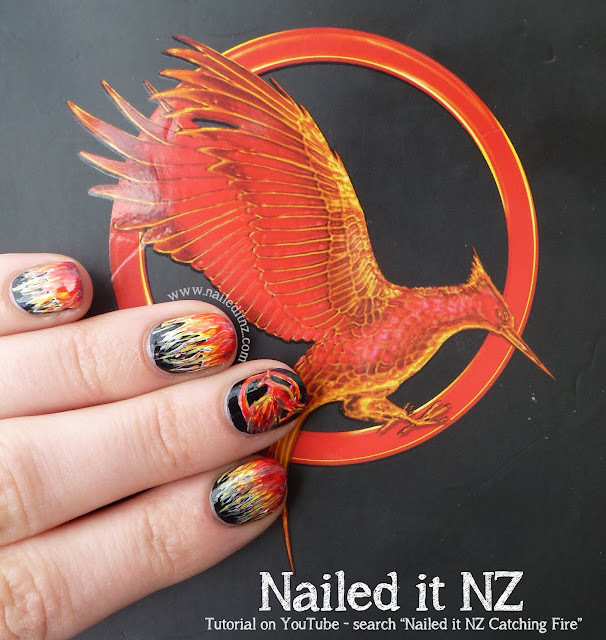 I've been a massive Hunger Games fan since I picked up the first book, and each time a new movie comes out I've done nails in theme. This year was no exception! I thought I'd share my latest Hunger Games tutorial with you, as well as the designs I did for both Mockingjay Part 1 and Catching Fire. I've done a few others as well but they were in my early nail art days, so they're not great. 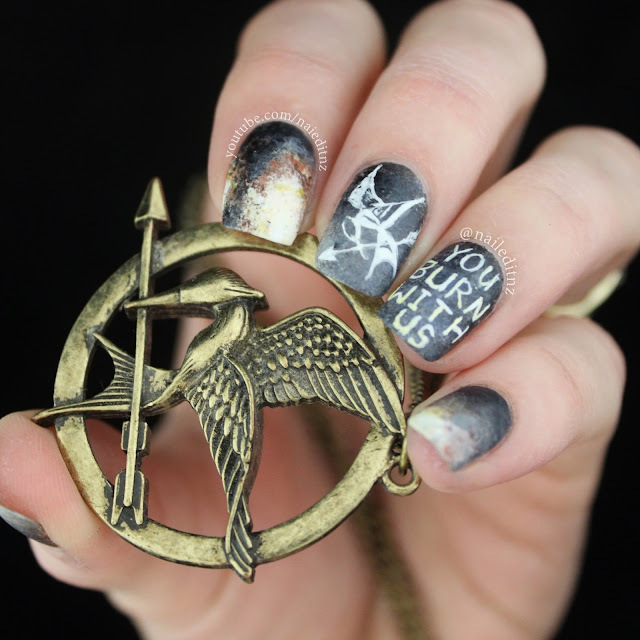 Still, if you want to check them out you can find all my Hunger Games-related nail art here. First, here's the most recent design, which I did for Mockingjay Part 2. I haven't seen the movie yet and am slightly scared of watching it - I know I'm going to ball my eyes out! I'm two weeks away from finishing my study, so I'll probably go after that as a celebration. The index finger and pinky are explosions and smoke here, and the middle finger has the Mockingjay symbol that was inspired by a flag that is held up in one of the movies. The quote on the ring finger is part of "If we burn, you burn with us" - which I just love! Watch the full tutorial for this design on my YouTube channel, here. 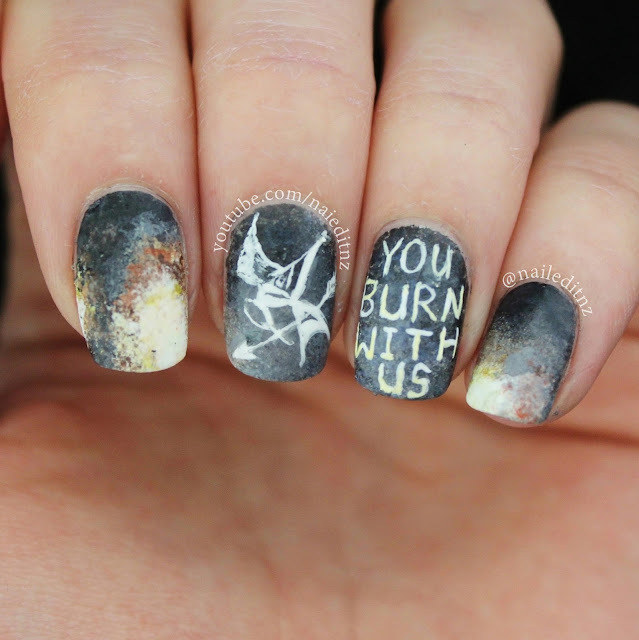 Here's the nail art I did for last year's release of Mockingjay Part 1 - an amazing movie! I was inspired by the book cover and did my best to copy the Mockingjay emblem on to my nails, and blue-hot fire on to the other nails. Watch the tutorial for this one here. And here's my design for Catching Fire; as you can see, the themes for 2013 and 2014 were very similar, which is why I went with something different this year. Watch the (probably awful, it's so old) tutorial for this nail art here. Have you seen the movie yet? I'd love to know what you think of it and if it did the book justice! Judging by the rest of the movies I'm sure it will.